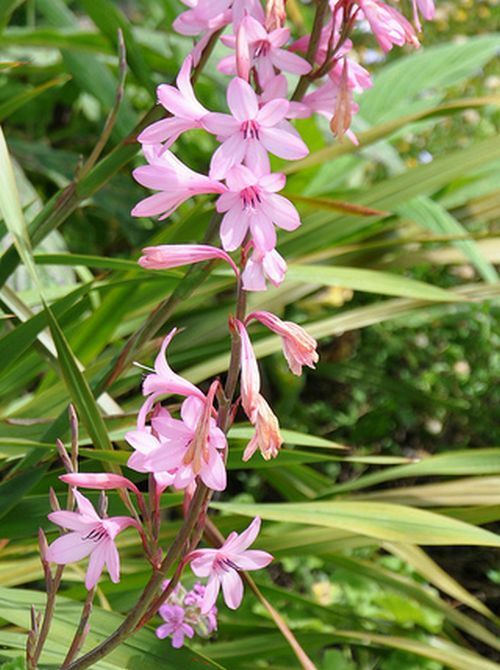 Watsonia plants grow from hardy bulbs, and range from 30 cm to 1.7 m in height. Foliage of sword shaped leaves and they bloom in towards the end of summer carrying trumpet shaped flowers on spikes; flowers may be red, pink or white. A commonly used name for Watsonia grown in the garden is Bugle lily. Common Names: Bugle Lily, Bulbil bugle-lily. Life Cycle: Hardy bulb. Half hardy bulb. Height: 12 to 80 inches (30—200 cm). Growing Region: Zones 8 to 10; and as an annual in cooler areas. Flower Details: Pink, white, red, orange, purple. Trumpets. Showy spikes of up to 25 flowers. Foliage: Herbaceous. Sword-shaped. Three or four erect leaves per corm. Seeds: 1/8 inch (3 mm). Autumn. Takes approximately three years for seed grown plants to bloom. Corms: 4 inches (10 cm). Autumn. Sow Inside: Middle of winter. Germination time: one to six months. Temperature: ~60°F (15°C). Transplant outdoors following the last frost. Space at 12 inches (30 cm). Requirements and care: Full sunlight. Good drainage. Soil should be enriched with manure. Regular watering while in bloom. Provide support. Bring corms indoors over the winter in cooler areas. Propagate: by dividing cormels late in autumn. Miscellaneous: Named after the English botanist and physician Sir William Watson. Invasive in many areas as it easily competes against other plants sharing its niche, some species have become naturalized in Australia. When growing Watsonia species such as Bugle lilies it is easiest to use bulbs purchased from a garden center or that someone has given you. 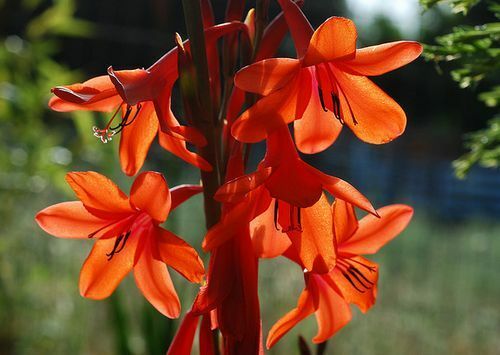 Watsonia bulbs should be planted at a depth of about 10 cm in the autumn. If growing from seed then be aware that it will take about three years until they will first flower. Seeds should be sown at a depth of 3 mm in the autumn. The Watsonia plants should be spaced about 30 cm apart in a sunny part of the garden that has a moist soil that has been enriched with manure. If you first want to grow indoors then start off about two months in advance. It should take from one to six months to germinate at 12 to 18 degrees centigrade; transplant the bugle lilies outdoors following the last frost of spring. As Watsonia plants are quite large they should be staked once they have become established. They are both hungry and thirsty so supply them with a liquid fertiliser once when they are growing and keep well watered. 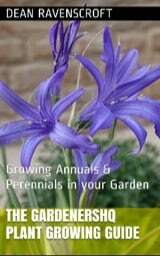 If you require more plants then more lilies can be propagated by division of the cormels at the end of autumn.